Tool & Die Engineering - Grand Rapids, MI - Walker Tool & Die, Inc.
Walker specializes in engineering complex, high-precision dies for medium-to- large parts in a wide variety of materials. At Walker Tool and Die, our process begins with a partnership between our design and engineering team and the client. We continue to work with the customer every step of the way, from complete Simulation and Prototype to 3D Design and part production validation. With open communication, we obtain valuable feedback throughout our production process to ensure customized, precise tooling that meets all industry and customer standards while optimizing production processes. Our 3D CAD Modeling utilizes both Siemens NX and CATIA software to create complex product surfaces supporting Simulation and Design processes. Walker can also 'Reverse Engineer' CAD model, detail components and part product geometry from data provided from our ATOS blue light scanner. Walker also provides product design services in CAD, typically a service addressing product feasibility issues during the Simulation process. This technology allows us to test and validate the complete design before we ever begin manufacturing the tool. Walker’s 3D CAD Modeling ensures the most efficient and total cost effective process of designing robust and production-ready metal stamping dies. At Walker Tool and Die, our Die Design services are backed by years of retained intellectual property and the latest technologies in order to assist clients with their custom die needs. Siemens NX software, along with custom created user functions, allows Walker to greatly reduce design lead time and ensure design accuracy. With experience in tooling all types of dies including blanking dies, transfer, progressive dies and line dies, our highly skilled designers and engineers can create processes for unique intricate tooling situations. Our Die Design services shorten lead times, maximize material utilization, eliminate waste, maximize production speeds, reduce maintenance and improve the overall quality of the part product and tooling. Walker Tool & Die, Inc. serves a variety of industries with high precision metal stamping and tooling dies designed and constructed for maximum operational efficiency and minimum waste and maintenance. For more information on how we can help your business, give us a call at (616) 735-6660. 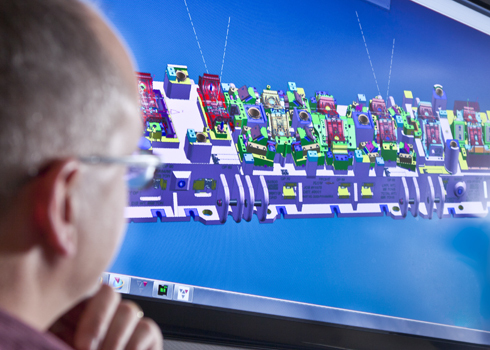 Die Simulation – Using leading-edge technology, our engineers perform simulations to validate tooling designs and part-material selections. 3D Modeling & CAD –We are able to design and test even the most intricate dies to verify their effectiveness for your manufacturing process. Die Design – Our design team includes engineers, designers and die makers with years of expertise in metal stamping tooling systems. We work closely with customers to develop innovative, cost-effective solutions to any tooling need. Die simulation can identify potential problems with the design prior to tooling construction. Our 3D modeling and CAD team uses Unigraphics software to develop a proven tool design that will perform in our customer’s manufacturing process.